Walsine Pierce: A PROBLEM OR AN OPPORTUNITY? You Get To Decide! while Socialism is equally divided poverty"
Good political words but his words did not match his actions. Roosevelt didn't just repeat what he thought should be done. He did it. When FDR devalued the dollar to be worth only $0.59, he literally gave to the have nots, after taking a large portion for his own ideas of how the government should be run. Part of the money people had denied themselves and saved up went to pay my Dad, and thousands like him, for digging a ditch. Over the Thanksgiving Holiday, I faced a serious opportunity. I baked a custard pie specifically for a friend and my daughter's father-in-law. Although Tom so graciously expresses his appreciation of my thoughtfulness, he doesn't know what's involved baking a custard pie. 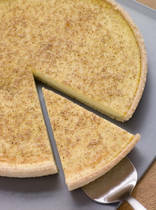 Basically a custard pie is just eggs, cream or half and half, salt, nutmeg, sugar, and ONE TEASPOON OF VANILLA. Super simple, bake 20 minutes at 450 degrees and 20 minutes at 350 degrees. That's it! When I put the pie on the rack to cool, I thought "it is so beautiful yet so simple". This pie went into my oven at 3:00AM, came out at 4:00AM. I had started to bake pies at 3:00PM the prior afternoon. I was too pooped to pop! I went straight to bed and as I dozed off to sleep thinking how simple that last pie was I realized I had not put in the vanilla. When I arose a few hours later I came up with an answer to save the pie. I simply took a teaspoon of vanilla and brushed it on top of the custard pie. I confessed to my daughter, who would be serving the pie, what I had done. Later, she told me Tom didn't notice the difference. No problem, just an opportunity, huh? 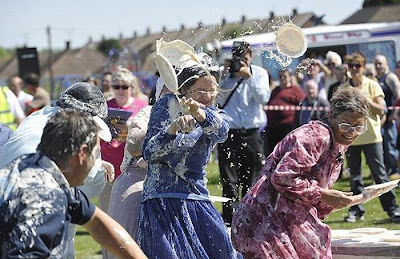 Did you know there is a "WORLD CUSTARD PIE THROWING CONTEST"? News to me also. There is even pie throwing teams. I don't know what it is but these people, however, do have a problem. Custard pies are not for throwing! What opportunities are you facing?